The Berlin stadium in which the 1936 summer Olympics took place – in Nazi Germany, involving lots of Nazi propaganda and pomp. This is partly also represented in the architecture itself, which still stands. This is why the place is not just a sports venue but also a dark tourism destination. More background info: The stadium was built for the 1936 Olympic Games in Nazi-era Germany. Many of the participating countries would only a few years later be Germany's enemies in WWII. The Nazis predictably exploited the opportunity of hosting the Games for an extravaganza of propaganda. Particularly (in)famous are the two "Olympia" films made by Leni Riefenstahl during the Games – they made (movie) history for being highly sophisticated and technologically pioneering works as well as for their highly dubious ideological slant, full of glamorization of the "Aryan race", the German(ic), the strength and unity of the Nazis, the likening of competition in sports with warriors, and so forth. But from a purely cinematographic point of view, they are clearly masterfully executed. What is probably the most lasting memory of the sporting achievements in these Olympic Games is the four gold medals of athlete Jesse Owens – but even that is partly due to the fact that his triumph can also be interpreted as an ideological victory in the light of all the racist Nazi ideology, since Owens was a black athlete from the USA. Otherwise, the Olympic Stadium of 1936 is rather associated with Nazi flags and Germanic-style monumental architecture. The former may be gone, but the architecture is still there. Together with those in Nuremberg, the Olympic complex in Berlin is the largest example of such monumentalism. Besides the stadium itself, this also comprises scattered sculptures, the two columns between which the Olympic rings are suspended and the tall bell tower ... a reconstruction – the original was destroyed in the wake of WWII damage. The stadium underwent a complete refurbishment in more recent years, especially to make it fit for the Football World Cup in 2006, and in the course of this it received a full roof covering the terraces. Originally it was a completely open oval dish in the style of Roman-Grecian stadiums that were the model for the Berlin one. The pitch in the centre was also lowered – and is now ringed by running tracks that are blue rather than the traditional brownish red. Completely gone is the rostrum from which Adolf Hitler watched over the Games ... it was removed on orders of the British, in whose sector the stadium ended up after the Allies' victory in WWII. The stadium today is still primarily an arena for large-scale sporting events – and is also the home of Berlin's football club Hertha BSC. In addition to sports the stadium also hosts big non-sports events, such as concerts. I was lucky enough to see the Rolling Stones play here in 1995 during their grandiose Voodoo Lounge Tour. These light-hearted uses of the stadium notwithstanding, its historic legacy and especially its association with Nazi times cannot be shaken off completely. It is to a large part for this very reason that this stadium features on many tourists' itineraries in Berlin. And given the dark nature of this history it also deserves being covered as a dark-tourism site here. Next to the main, eastern gate there's a visitor centre with a shop, selling mainly touristy souvenirs and memorabilia associated with the resident football club Hertha BSC, but it also has a few books about the stadium and its history as well as postcards and leaflets you can pick up. Through the visitor centre, the stadium itself can also be visited (as long as there's no sporting or other event going on at the time), either individually or on a guided tour (which includes sections "behind the scenes" which are normally inaccessible to the public), If visiting self-guided an optional audio-guide can be hired at the visitor centre – or you can download it as an app onto your own smartphone (available in English, as well as in German, French, Italian, Spanish). When I visited the stadium in May 2016 I opted for the self-guided tour without an audio-guide (simply because I'm generally not a great fan of these – and they get in the way of photography), so I cannot comment on the quality of the narration. There is also plenty of information in the form of text-and-photo panels dotted around the whole complex. And I found these quite sufficient. Additional information panels about the history of the place can also be found in the openly accessible areas around the stadium too. All of these are bilingual in German and English. Inside the fenced area, accessible only through the visitor centre, you can get up close to the stadium building and also access parts of the inside. The inside has the most altered look from the original 1930s appearance due to the roof, plastic seats and modern fixtures such as two video walls. But it is impressive for its size alone. 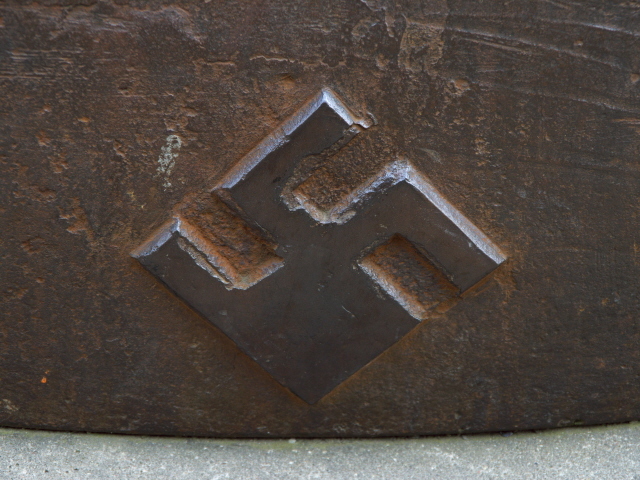 The outer facade of the huge oval structure delivers the expected elements of Nazi intimidation architecture, with its square columns and iron torch lamps. 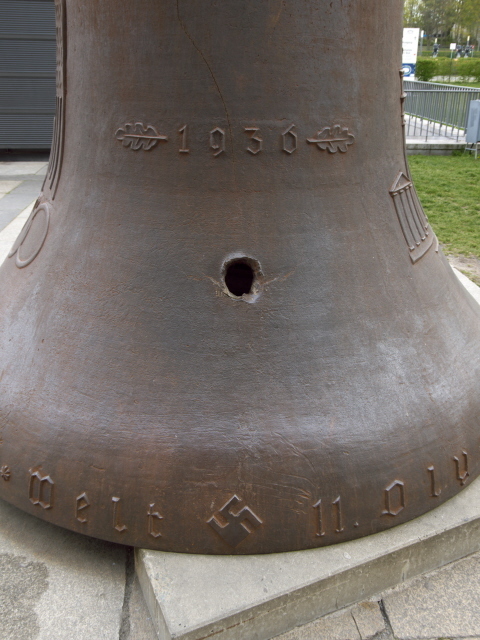 The most obvious Nazi-era relic, however, is the old Olympic Bell, now no longer hanging in the bell tower, but stranded outside the stadium's southern side. 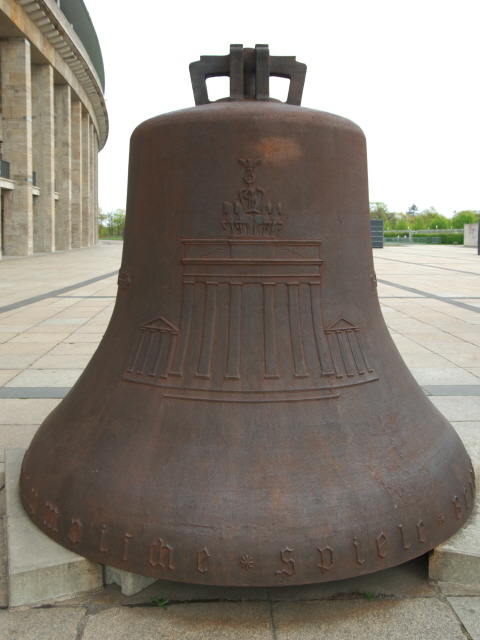 On the bell are depictions of the Brandenburg Gate and a Reich Eagle clutching the Olympic rings in its talons, on the other sides the year “1936” is stated. More Nazi elements can be found in the form of the ensembles of giant stone sculptures, mostly depicting muscular naked men, although there are also a few equally masculine-muscled horse sculptures on the western side of the stadium. Also on the western side of the stadium, there's normally the so-called marathon gate – the gap in the stadium's walls aligned with the main axis of the stadium and the bell tower behind it. This is also where the historic fire cauldron for the Olympic Flame of 1936 still stands. When I was there, however, it was invisible and the gap/gate was closed due extra temporary seating terraces set up for the then upcoming German Football Cup finals (these temporary seats were probably to be removed again afterwards). Along the south-eastern edge of the area stands a row of stelae honouring the Olympic medallists of 1936. This is echoed on the north-eastern side by a modern row of complementing stelae honouring German Olympic champions of the Games since 1936 as well as a Walk of Fame for the winners of the German Football Cup over the years. Right opposite the northern curve of the stadium is the old swimming stadium of the 1936 games. At the time of my visit it was undergoing refurbishment, but the outside facade, though looking a bit dilapidated, was still clearly of a very similar Nazi-era design to the main stadium. To the west of this survives a relic from another former swimming pool, which itself has gone, namely a row of colonnades. Back at the eastern gate, the two towers between which the Olympic Rings are suspended, are these days the most conspicuous reminders of the complex's original purpose. At the bottom stands a single tree, the so-called Podbielski oak, named after one of the planners of Berlin's Olympic Stadium and the only one left standing when the area was cleared to make space for the 1936 Olympic Games. Outside the fenced area of the stadium and its inner parts, you can (freely) explore yet more architectural relics from 1930s dotted around various further playing fields and football pitches. The very largest grassy space is the so-called “Maifeld” ('May field'). At the time of my visit in May 2016 much of it was covered with huge marquees, containers, air-con units and other equipment, possibly in preparation for a big event (Cup Final, maybe), but in a far corner I could spot a team of cricketers practising. Towering above this large playing field and the whole complex is the bell tower. This is a separate sight in itself, and has to be accessed independently of the rest of the stadium complex. At the bell tower a separate admission fee is charged too. You can take a lift to the viewing platform on top of the tower, which commands fabulous views over the Olympic Stadium and the surrounding area. For dark tourists, however, it will be the inside of the base of the tower tower that's the even greater attraction: it is here that a small exhibition (put together by the German Historical Museum) covers the historical background of the place, including the dark bits of the Nazi showcased games of 1936. In addition to photo-and-text panels (in German and English) a film is also screened. I haven't yet managed to see this latter part of the complex yet, but it's high on my to-do list for when I'm next in Berlin, and I will report more then. Location: far in the west of Berlin, north of Grunewald, in the district of Charlottenburg-Wilmersdorf. Access and costs: Fairly easy to get to by public transport, but some walking is necessarily involved; free to view from a distance, but getting inside costs an admission fee. Details: The stadium complex is quite a distance from the centre of Berlin, but it is quite easily accessible by public transport. There are even two stations called "Olympiastadion". One is on the U2 metro line (which goes through many useful central Berlin stations). From there it is a ca. 500m walk to the eastern gate. Alternatively there's the other station of the same name nearer the south gate to the stadium (ca. 250m walk). This one is served by the regional metro train lines S9 and S75. For the bell tower the station one stop further west ("Pichelsberg") is even closer; from there it's just a few minutes walk up Passenheimer Straße. Stadium opening times (with or without audio-guides): varying seasonally – in winter from 10 a.m. to 4 p.m., from April to October from 9 a.m. to 7 p.m. and in August until 8 p.m. (last admission half an hour before closing). Costs: admission 7 EUR (concession 5.50 EUR, children 4 EUR), audio-guides: 4 EUR (in addition to admission). Guided tours are offered on different themes and different degrees of depth and most also give access to e.g. the VIP sections, the players' changing rooms and other underground parts. The regular “highlights” tours take place at different fixed times of the day, more frequently in summer than off season (check the olympiastadion-berlin website for exact details) and cost 11 EUR (concession 9.50 EUR, children 8 EUR). These are regularly offered only in German. But English-language tours can also be booked online (see the schedule on the stadium's website) for a small surcharge (1 EUR more). There's usually just one English tour per day, so plan ahead. Unfortunately, the online booking engine is only partially available in English, some crucial elements still appear in German. Basically you have to select a date and time from a calendar and then enter the number of tickets required in the pink box in the centre under “Anzahl”. Go to check-out by clicking the orange box “Warenkorb” at the bottom and in the next window “Zur Bestellung” to get to the payment page. Here you have to register (title, first name, last name, company, street and house number, post code, city, select country from a drop-down menu, and provide telephone and e-mail contact details). Further down you can check the print-at-home option (costs an extra euro, but is cheaper than having tickets sent by post) and don't forget to also tick the terms-and-conditions box – “AGB” in German – then proceed to payment. Group tours can even be customized on demand, including a focus on the historical or architectural aspects (for details and bookings email tour(at)olympiastadion-berlin.de, or phone +49-30-28018-118). NOTE: if any events are taking place in the stadium, no visits are possible. During preparation work for events (concerts, etc. ), parts or even all of the stadium may not be accessible either. Opening times: from April to October between 9 a.m. and 6 p.m., daily. Time required: for just a quick look at the stadium, the openly accessible area and maybe the visitor centre, half an hour or so may be enough. Visiting the inside obviously requires considerably more time. Regular guided tours of the stadium (including glimpses "behind the scenes") last between 60 and 75 minutes, the audio-guides for self-guided visits have a running time of 65 or 100 minutes. The bell tower has to be factored in separately too – visitation time will depend on how deeply you want to study the exhibition and how long you'll take enjoying the view from the top. Something like 45 minutes should be a reasonable guess. Combinations with other dark destinations: in general see Berlin – there's one dark attraction that a visit to the Olympic Stadium could be combined with, provided you don't mind a little hiking: the former US listening station Teufelsberg, one of Germany's most intriguing Cold War relics. It's in the middle of the Grunewald forested recreation area south of the Olympic Stadium. You can walk it all the way (ca. 45 minutes) or take one stop on the S-9/S75 to “Heerstraße” to shorten the route a little. From there head south and up the second hill you pass. You will have seen the white radomes at the top from a distance already. Proceed along the path uphill and past the slope beneath the station to get to the entrance gate, which is at the opposite, southern end. You can just look around unguided or go on one of the historical guided tours offered at weekends. If you then feel fit for even further hiking, you could continue south-east towards Grunewald station with its platform 17 monument. From there you can get a regional metro train (S7) back into the centre of Berlin. In the other direction it takes you to Wannsee and Potsdam. Combinations with non-dark destinations: The Grunewald just south of the stadium is Berlin's largest green oasis, a vast area of mostly forest stretching down along the eastern banks of the Havel to the Wannsee Lake, where there is even a beach club. Two of West Berlin's mainstream tourist sites are also not too far from the Olympic Stadium: One is the Funkturm, a steel lattice tower that looks a bit like a mini Eiffel Tower, located at the main trade fair grounds of West Berlin ('Messe'). The other is Schloss Charlottenburg, a royal palace begun in the reign of King Frederick the Great. It's a classic baroque extravaganza and a major tourist attraction for those into such things.